Today I’m helping an air conditioning company called Actron Air . This review is based on the keyword “air conditioning perth”, performed on 19/09/2017. So what can Actron Air do to improve their Adwords campaigns? What’s the Ad Aiming to Acheive? The first thing to review is whether the purpose of Actron Air’s ad is clear. In the case of air conditioning, I would say their main purpose should be to ask they visitor for some details so they can provide a quote. 1) The ad doesn’t specifically mention the word quote, however it’s very clear that the landing page is all about asking the visitor for details to be able to provide them a quote. I think they could improve their conversion rates by telling the visitor in the ad that they can get a free quote when they click through. Have the Ads Been Written to Boost CTR? The next thing to review is whether Actron Air ‘s ads have been written to boost CTR. Having a high CTR results in lower cost per clicks and is very important for improving the Ads quality score. Having the keyword the user types in the ad itself is something that can improve CTR. Description: Save Up To $900 A Year On Air Conditioning Perth! Call Actron Air today for your free consultation. How Can The Landing Page Be Improved? 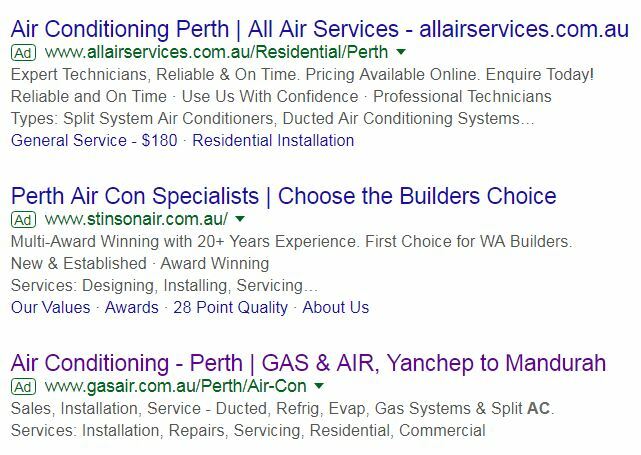 3) Based on the above Actron Air should update their landing page to include the keyword air conditioning Perth in their meta description, H1 tag and body copy. This will improve their quality score and lower their cost per click.